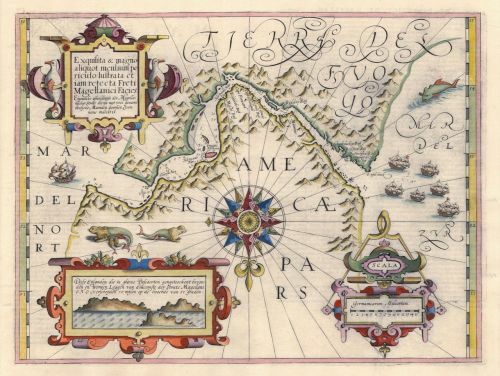 The geographic details for the map of the Straits of Magellan came from Bernardus Joannis Monasteriensis[?] who had participated in the first Dutch expedition to sail through the Straits in 1599-1600. The map was printed from a copper plate engraved by Lambert Cornelisz in 1606. Made prior to the confirmation of a route around Tierra del Fuego, the Strait was, at that time, the only passage between the Atlantic and Pacific Oceans. Controlled by the Dutch, exorbitant fees were charged for the passage.